National Read an Ebook Day! Yay an excuse to read! Today is Read an Ebook Day! I have been giving my Kindle the cold shoulder lately so I think it’s time we get re-acquainted. 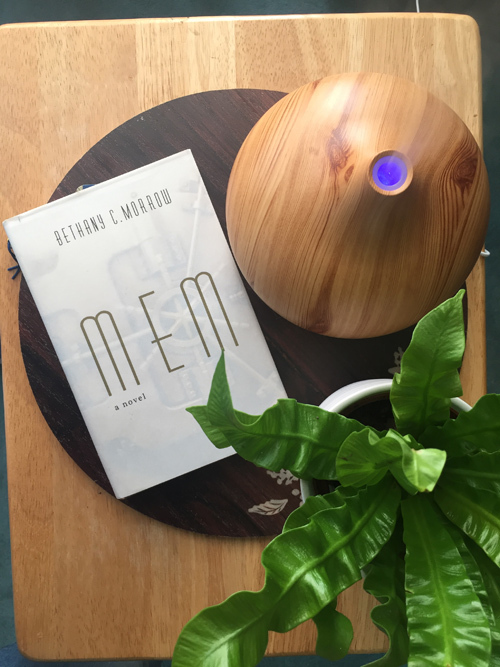 Today’s weather could not be more perfect to get lost in a book. It’s cloudy and on and off downpours. So I will be taking 2 hours out of my work day today to do a bit of reading. I have everything set up to go. I will be putting Chai tea in the teapot you see in the photo so I can cozy up with my blanket lose myself. I recently joined an online book club that focuses on female authors of science fiction and fantasy. It’s a genre that I haven’t read much in a bit so I like the idea of getting introduced to some new authors. 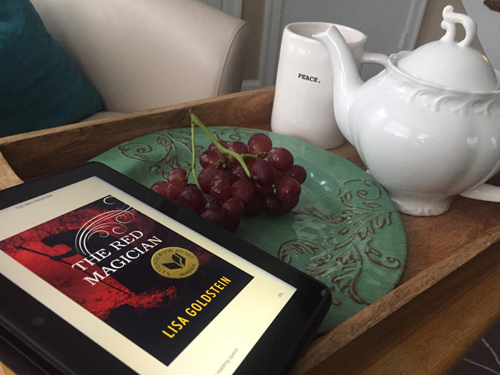 Our first selection is what I will be reading today and that is “The Red Magician” by Lisa Goldstein. Are you celebrating National Read an Ebook Day? If so, whatcha reading? Let’s face it, I have plenty of books in print that I own and have not read yet. But the booklover I am, I can’t pass up good eBook bargains. I bought these three within the last two weeks at deep discount. Although some of them may have gone back up in price, most aren’t too much higher than what I originally paid for them. They don’t take up physical space in my home so it’s quite easy to collect a heap of books. These three are the latest in the scifi/fantasy category. The most recent is called “A Mortal Song” by Megan Crewe. Is a stand-alone fantasy that some have described it as “Japanese folklore meets Percy Jackson/Harry Potter-ish” story. I was first drawn in by the cover art and then the description and then the price of 99 cents sealed the deal. The author has won some awards and has written quite a few books so that also was a selling point. The second one is called “Curse” by Dale Furse, an Australian Female Science Fiction author. This book is the first in a trilogy. The cover is more stunning in person, the three books all cost $2.99 each and I can loan them to others on Amazon Kindle accounts. The book is a bit of Scifi/Fantasy and maybe coming of age story. The main character finds out that she is a mix of two warring alien species. I think it will be fun to give this one a go. So those are three. I will try to pull together my finds by genre to make it fun and easy to share with you all. Perhaps it will get me to read them sooner when I pull them out and take a look. In my mind, they can always be read on the go (trips, appointments, in-between print books) so I don’t mind collecting them at such deep discount. Happy reading my bookworm people! Wow, it’s been a while since I have written a review. Don’t be fooled, because I have still been ferociously reading books! This is one I recently read. 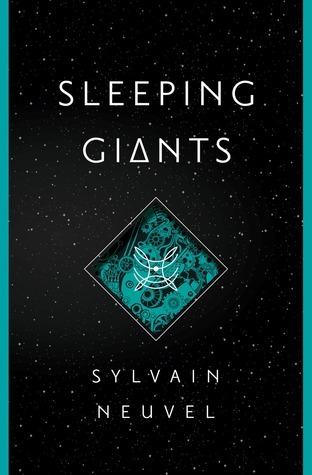 I heard about this book from the online book community and it sounded like a good sci-fi fix. So I placed it on an e-book hold before it was released. I was more than thrilled to receive the email informing it was available from the library to read. I jumped right in and honestly found this book so easy to step into. I wasn’t sure if I would go for the interview transcripts format but I actually loved it. It kept the pace moving nicely while making it easy for the reader to keep up. What draws me to science fiction is the possibilities, the unknown, and the mystery. This book had a little of each. So I was pleasantly satisfied. I don’t want to spoil this book for any intended readers so I won’t say more except that it was a fast read and very enjoyable. I also should point out, that it is the first book in what might be a series or a trilogy. Not sure which. But to be honest, it was a great stand alone read too. I will be back with more books soon. Because I have been devouring so many. I hope you fill your summer with great reading adventures. They sure do make the summer even more special for me. Although I enjoy science fiction, I can’t say I have read a lot, but from my perspective, I would rate this book a 4 1/2.